Linda Kaplan Thaler and Robin Koval have moved to the top of the advertising industry by following a simple but powerful philosophy: it pays to be nice. Where so many companies encourage a dog eat dog mentality, the Kaplan Thaler Group has succeeded through chocolate and flowers. In The Power of Nice, through their own experiences and the stories of other people and businesses, they demonstrate why, contrary to conventional wisdom, nice people finish first. Turning the well-known adage of “Nice Guys Finish Last” on its ear, The Power of Nice shows that “nice” companies have lower employee turnover, lower recruitment costs, and higher productivity. Nice people live longer, are healthier, and make more money. In today’s interconnected world, companies and people with a reputation for cooperation and fair play forge the kind of relationships that lead to bigger and better opportunities, both in business and in life. 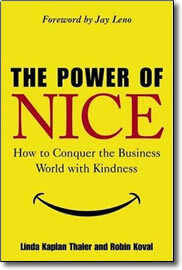 Kaplan Thaler and Koval illustrate the surprising power of nice with an array of real-life examples from the business arena as well as from their personal lives. Most important, they present a plan of action covering everything from creating a positive impression to sweetening the pot to turning enemies into allies. Filled with inspiration and suggestions on how to supercharge your career and expand your reach in the workplace, The Power of Nice will transform how you live and work.